The Most Important Questions on Starting A Blog ANSWERED! It’s important to keep your car clean and tidy. First of all, it just looks better and gives a better impression to others, since other people will notice your car, whether you like it or not. Second, it just feels nice when it’s fresh, clean, and smells good. And third, if your windows aren’t clean and the mess inside your car is distracting you from driving, it can affect you and your passengers’ safety. Therefore, it’s vital to regularly wash your car. However, the automatic car wash doesn’t do a proper job, and getting it professionally cleaned can cost a lot of money. If you’re on a budget and don’t want to spend cash on cleaning or buying expensive products, these ten hacks will help you get your vehicle squeaky clean and shiny! Hair conditioner usually contains lanolin, a type of wax, which will make your car shine. Most importantly, it will help you avoid the water spots caused by rain or dew. Plastic headlight lenses tend to get dull and dirty, as the UV rays from sun mix with rain and road grit. Plus, they might get foggy due to oxidization over time. To maintain proper functioning of headlights as well as keep them clean and fog-free for a clear view, use the toothpaste. The lint-free material of the coffee filter is perfect for wiping car dashboards, the center console and other parts. Dirty shoes make your car carpets look stained and soiled. This two-ingredient carpet cleaner recipe is super effective and will leave your car smelling nice. All you need is some hydrogen peroxide and essential oil. Want to make your tires and hubcaps look brand you? Simply mix one-half cup baking soda, one tablespoon dish soap, and two cups warm water in a small bowl. Then use a sponge to gently wash and scrub your car rims. Removing stickers is not as easy as putting them on. If you need to remove that old bumper sticker, you’ll need a hair dryer, razor blade, sturdy plastic card, towels, some cleaning solution, and a bit of patience. Traditional wipes or dashboard sprays are expensive, full of harmful chemicals, and often don’t do the job properly. Instead, use olive oil and some paper towels to make your car dashboard clean and shiny. If you take your pets for a ride, your car probably gets full of dog or cat hair. You can remove it with a squeegee and a spray bottle of water. To avoid accumulating your furry friends’ hair on your car seats, next time use a blanket. If your car smells bad, it ruins the whole driving experience, plus it’s embarrassing when you’re giving someone a lift. Use the baking soda to absorb and neutralize the nasty smells and be proud of your fresh-smelling vehicle again. Because of the slime’s natural malleability, it can clean otherwise hard to reach crevices and crannies without making a mess. Make your own using these instructions. The vents in your car can be a big pain to dust since the slots are so small. But by using a simple foam brush (which you can find in the art store or art section of a store), you can get them clean in no time! Taking care of your car requires effort, whether you take it to the professionals for washes, waxes, and detailing, or you spend time to make it shine yourself. 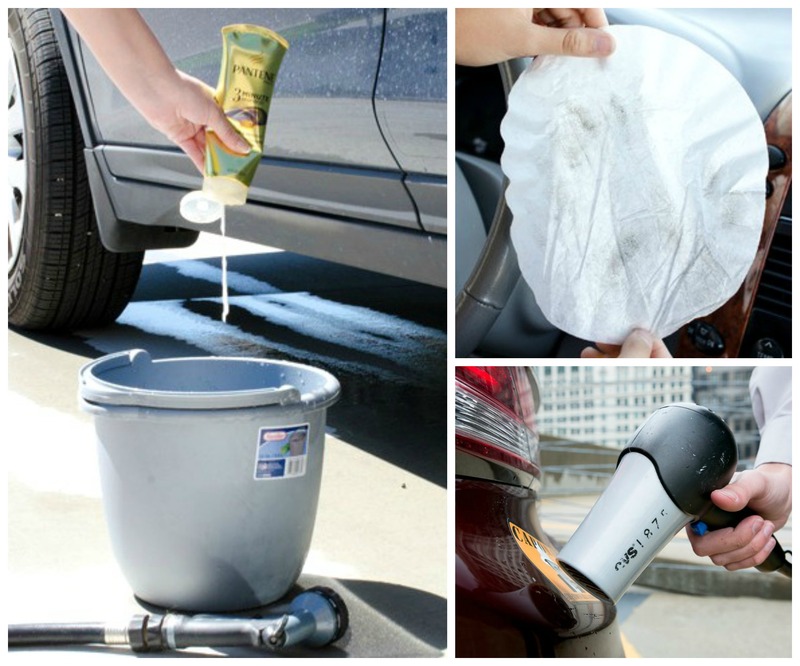 These easy cleaning hacks will help to get your vehicle looking sparkling clean. Let me know what your favorite car cleaning hacks are in the comments and as always, if you have any questions I’d love to help you out!